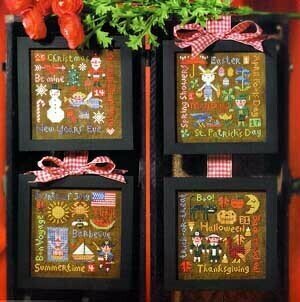 Kit Includes: Beads, treasures, 14 Ct. perforated paper, pattern, floss, needles, magnet and instructions. Finished size: 1.75" x 3.25"
Model stitched over 2 threads on 28 Ct. Beautiful Beige line with Weeks Dye Works and DMC floss. Stitch Count - top and bottom 58x58 (2 pieces), side panel 34x232. 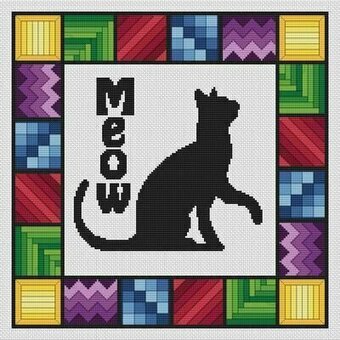 Shown with Just Another Button Company - M is For Meow Pinset (JP218). Comes with Weeks Dye Works felted wool. 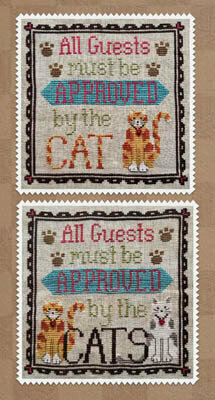 "All Guests must be approved by the cat(s)" Model stitched on 30 Ct. Parchment using Weeks Dye Works and buttons from Just Another Button Company (or all DMC floss white, 676, 610, 3371, 646, 597, 989, 920, 3328). Stitch count is 92W x 92H. Model stitched on 14 Ct. Eek Aida by Picture This Plus with DMC floss and Weeks Dye Works floss. Stitch Count: 74x101. Comes with charms. "A house isn't a home without the ineffable contentment of a cat with her tail folded about her feet." Model stitched over 2 threads on 30 Ct. Abecedarian with Classic Colorworks floss, Gentle Art Sampler threads and Weeks Dye Works floss. Stitch Count: 173x134. "Why are you surprised?" Model stitched on 40 Ct. Soft Ivory Linen using Gentle Art Sampler Threads, and Classic Colorworks (or all DMC floss 930, 833, 310, 927, 3782, 3828, 869). Stitch count 106W x 57H. 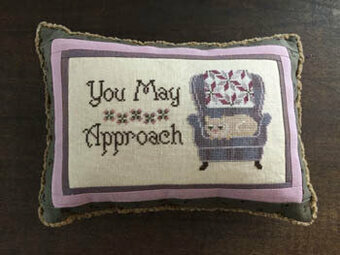 "You May Approach" Model stitched on 40 Ct. Stars HOllow Linen using Weeks Dye Works, and Classic Colorworks (or all DMC floss 935, 3371, 3042, ecru, 778, 3041, 3863, 3726, 3864). Stitch count is 117W x 62H. 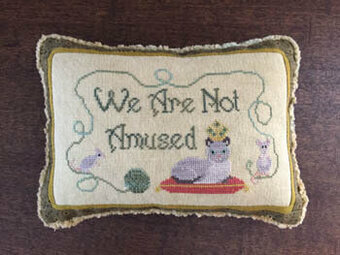 "We are not amused" Model stitched on 40 Ct Antique Gold Linen using Weeks Dye Works, Gentle Art Sampler Threads, and Classic Colorworks (or all DMC floss 03, 3362, 18, 3830, 3779, 3371, 3866, 535, 3053). Stitch count is 121W x 68H. 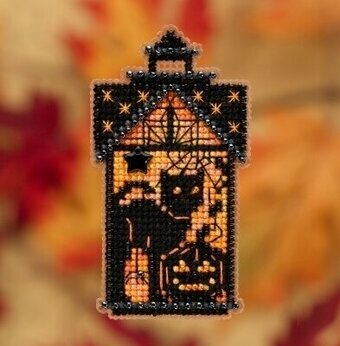 Model stitched on 30 Ct. Carved Pumpkin by R&R Reproductions with Gentle Art Sampler threads (or DMC 3371). Stitch Count: 154W x 100H. Shown finished as a pincushion or sampler. Finishing instructions included. Stitch Count: 154W x 100H. 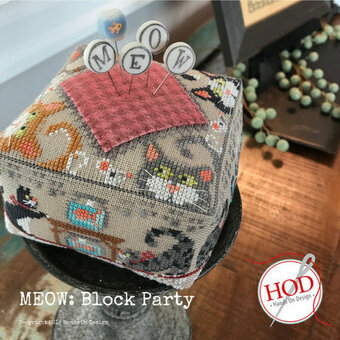 If stitching as a pincushion, the additional top piece has a stitch count of 31W x 31H. 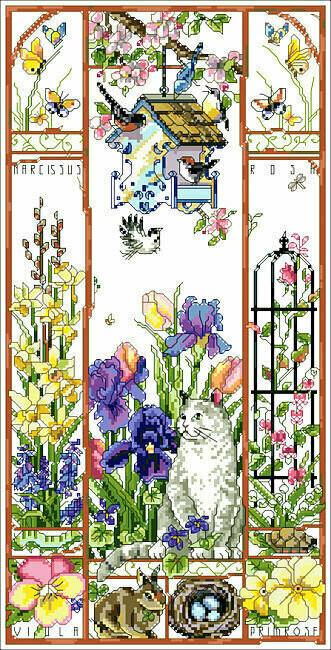 Cross stitch kit featuring a cat and butterflies. 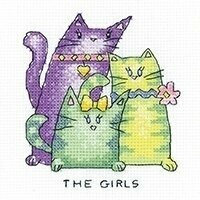 This cross stitch kit contains presorted thread, 14 count white Aida, needle, black & white chart, and instructions. 136 х 183 stitches. Finished size 9.4" x 12.8". 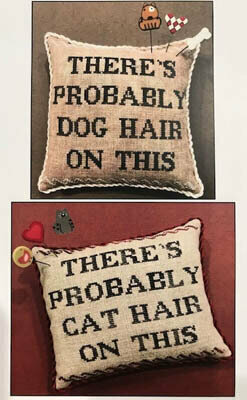 "There's probably dog/cat hair on this" Dog hair model was stitched on 40 Ct. Mocha and the cat hair model stitched on 40 Ct. Confederate Grey using Weeks Dye Works and Gentle Art Sampler Threads (or all DMC floss 3031, 822, 902, 3799). 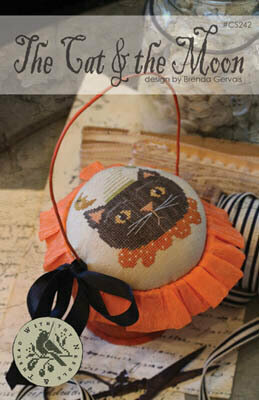 The Pin-Mini Dog Lover jpm446 and Cat Lover jpm447 from Just Another Button Company. Stitch count for both is 86W x 76H. 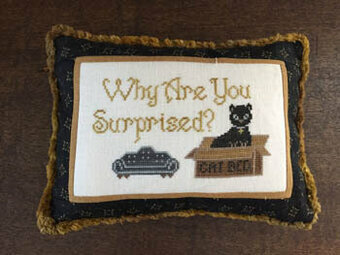 Model stitched on 28 Ct. linen of your choice using Gloriana Silk Floss and DMC floss (or all DMC 310, 908, 346, 740, 741). Stitch count is 111W x 147H. Based on the artwork of Jamie Larson. Model stitched on 14 Ct. White Aida with DMC floss. Stitch Count: 168x168. 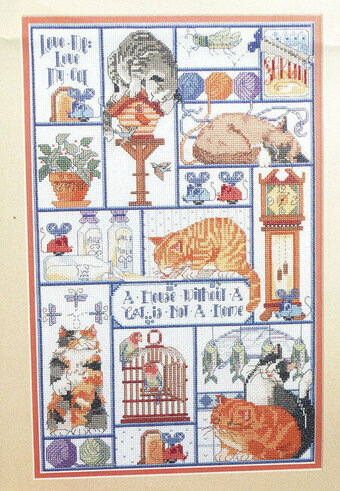 Scenes of winter birds, squirrels and plants surround a napping kitty in this seasonal sampler. Stitch Count 113w X 224h, finished size 14 ct: 8" X 16". 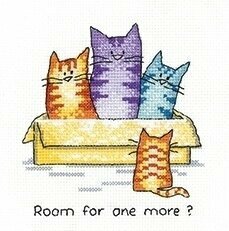 Design stitched on 14 Count White Aida. Design by Nancy Rossi. 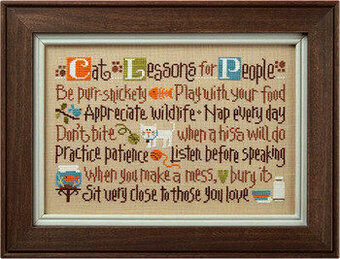 "Be purr-snickety - Play with your food - Appreciate wildlife - Nap every day - Don't bite when a hiss will do - Practice patience - Listen before speaking - When you make a mess, bury it - Sit very close to those you love". Model stitched on 32 count Natural Light Linen with Weeks Dye Works (Grasshopper, Moss, Pumpkin, Swiss Chocolate (2), Whitewash), Crescent Colours (Caterpillar-2, Really Teally), and DMC floss (472). 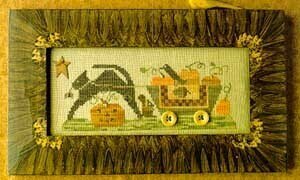 The stitch count is 162W x 107H. Model stitched on 35 Ct. Beige linen by Weeks Dye Work with Needlepoint Inc silk and DMC (or all DMC 3772, 3852, 782, 3826, 470, 415, 3861, 779, 645, 310,3799). Stitch Count: 114 x 151. 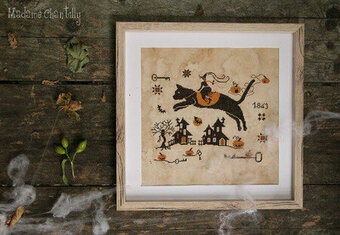 Black Cat and Spiders are the third and fourth of twelve designs from the Halloween Series. Models stitched on 30 Ct. Weeks Dye works Mocha Linen with Gentle Art Sampler threads and Weeks Dye Works. DMC conversions are 937 3822 720 3853 310 3837 712 3833. Stitch count for each design is 77W x 38H. Includes buttons. The series is stitched on 32 count Dirty Belfast Linen and has a stitch count of 77W x 338H. These are no ordinary cats! It's the reason cats have been granted "nine lives" and why we find them in the most peculiar places precariously following their instincts. 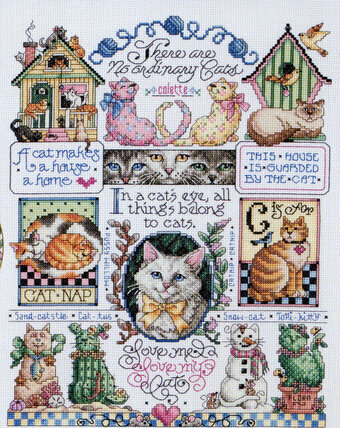 They look at themselves as "king", protector, playful and well-bred with lots of "cat-I-tude" in this Counted cross-stitch design by Sandy Orton. Stitch Count 140w X 183h, Finished Stitch Size on 14-ct 10w X 13h. 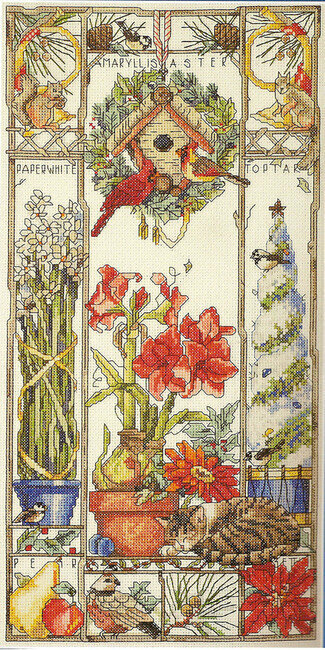 Design stitched on 14 Count White Aida. 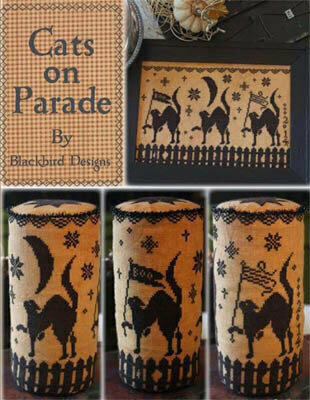 Design by Sandy Orton. 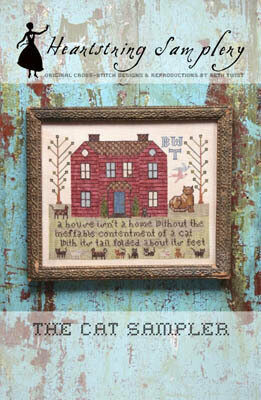 Spring Cat Sampler. 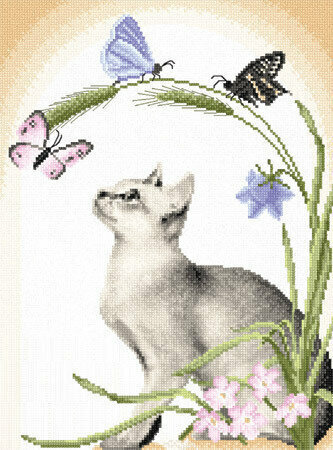 An adorable white and gray cat sits peacefully among the birds, butterflies and other critters. This scene is alive with beautiful color and gorgeous flowers. All of the signs of spring in one window. Stitch Count 112w X 224h, finished size 14 ct: 8" X 16". 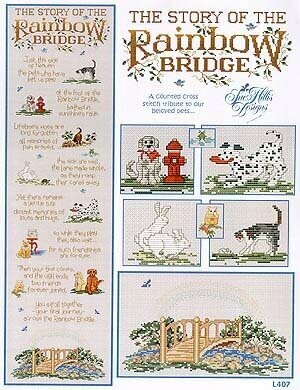 Design stitched on 14 Count White Aida. Design by Nancy Rossi. This golden cat is enjoying watching the birds feeding, and the butterflies and flowers all around. This scene is alive with beautiful color. Stitch Count 122w X 224h, finished size 14 ct: 8" X 16". 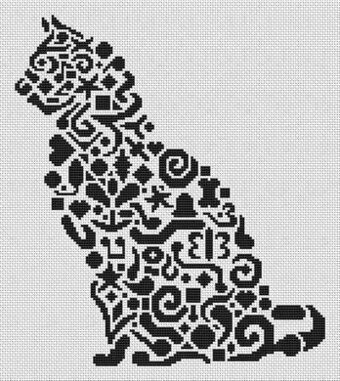 Design stitched on 14 Count White Aida. Design by Nancy Rossi. Love Me Love My Cat says it all. Cats napping, cats stalking, cats playing with all sorts of things that cats love. Our cats are busy being themselves in all kinds of mischievous places. The chart is in full color with DMC floss colors listed and general directions. Stitch Count 140w X 224h, Finished size on 14ct 10" X 16". Design by Nancy Rossi. 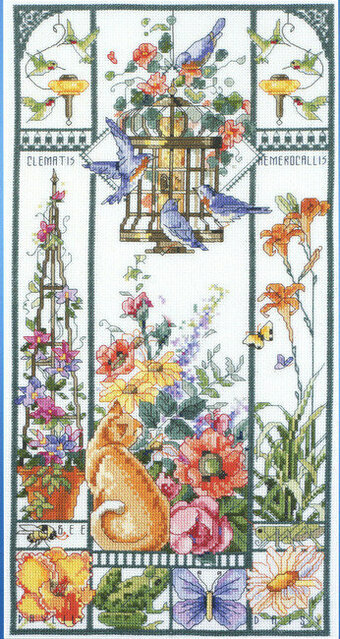 Complete kit includes 14 Ct. Grey Aida, thread, needle, chart and instructions. 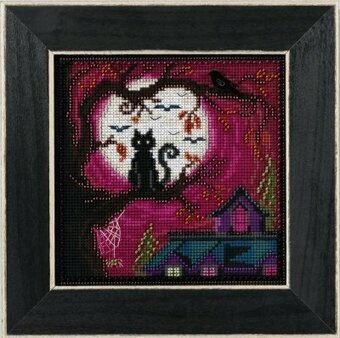 Finished size: 10" x 16.8"
Model stitched over 2 threads on 27/28 Ct. fabric of your choice with DMC floss. Design size: 3 3/4" x 4". Designed by Peter Underhill. Model stitched on 36 Ct. Oaken by Picture this Plus using Weeks Dye Works Floss (or DMC 739, 931, 935, 869, 647, 930, 3790, 932, 642, 645, 422, 831). Stitch count 91x91. 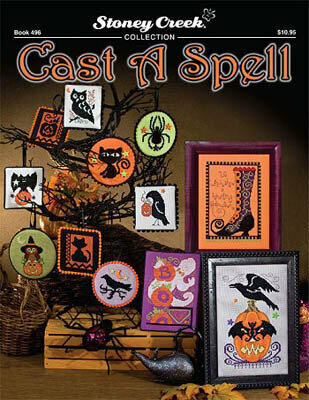 Kit Includes: Beads, treasures, 14ct perforated paper, floss, specialty threads, needles, chart, magnet and instructions. Size: 2.5" x 2.5". Model stitched on 28 Ct. Lambswool Linen with Classic Colorworks and Weeks Dye Works floss (or DMC 992, 3853, 720, 962, 3031, 3348, 310, 731, 869, 920, White). Stitch Count: 189W x 17H. Stitch Count: 38H x 99W. Embellished with rusty tin star and sandstone buttons. Model stitched over 2 threads on 40 Ct. Sheep's Straw linen by R&R Reproductions with Weeks Dye Works floss, Gentle Art Sampler threads, and Classic Colorworks floss. Stitch Count: 52W x 53H. Finishing instructions included. 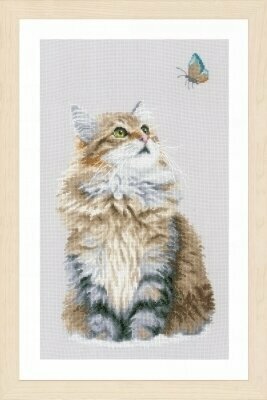 Cross stitch kit featuring a cat. 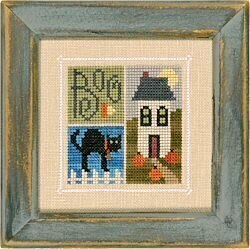 This cross stitch kit contains presorted thread, 16 count white Aida fabric, needle, color chart, and instructions. 106 х 220 stitches. Finished size 6.7" x 13.75". Model stitched on 14 Ct. Tropical Orange Aida or Orange Pumpkin Aida or Prank by Picture This Plus with DMC floss (or any black floss). Stitch Count: 57x99. Comes with charm. 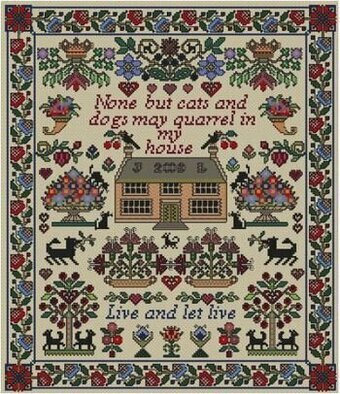 "None but cats and dogs may quarrel in my house - Live and let live". Stitched on your choice of fabric with DMC floss. Stitch Count: 184W x 215H. Based on the artwork of Jamie Larson. Model stitched on 14 count White Aida with DMC floss. Stitch Count: 127 x 144. 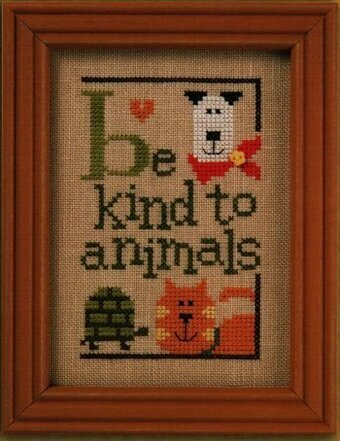 Be Kind to Animals is the third of six designs from the Green Flip-It Series. 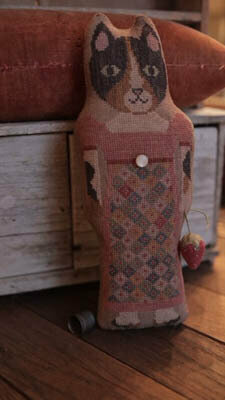 Model stitched on 28 count Light Mocha Cashel Linen with Gentle Art Sampler Threads, Weeks Dye Works & DMC floss. Button (included). The stitch count is 40W x 63H. The entire series is stitched on 32 count Light Mocha Belfast Linen and has a stitch count of 265W x 79H. 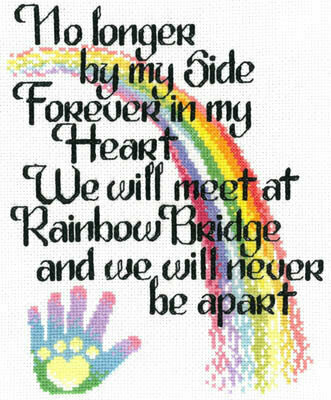 A counted cross stitch tribute to our beloved pets..."Just this side of heaven, the pets who have left us play at the foot of the Rainbow Bridge..." Model stitched on 28 Ct. Antique White Lugana. Stitch Count: 127W x 497H. 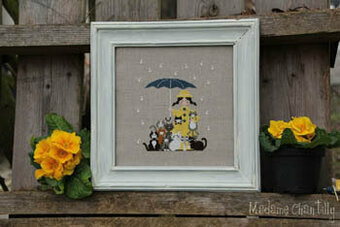 "Up on the Woof Top" stitched over 2 threads on 28 Ct. Lambswool linen. Stitch Count: 80W x 100H. 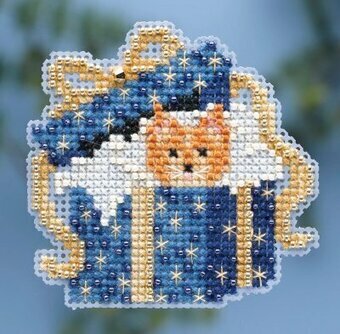 "May Christmas Dreams Come True" stitched on 32 Ct. Morris Blue linen. Stitch Count: 80W x 100H. Both models use Gentle Art Sampler threads and DMC floss (or all DMC 310, 500, 436, 304, 334, 814, 502, 729, 930, 975, 712, 561, 3021, 415, 738, 962), Rainbow Gallery Nordic Gold and shown with buttons from Just Another Button Company. Model stitched on 40 ct fabric color of your choice using DMC floss. Stitch count 172x140. Model stitched over 2 threads on 28 Ct. Mirage Lugana by Picture This Plus with DMC floss. 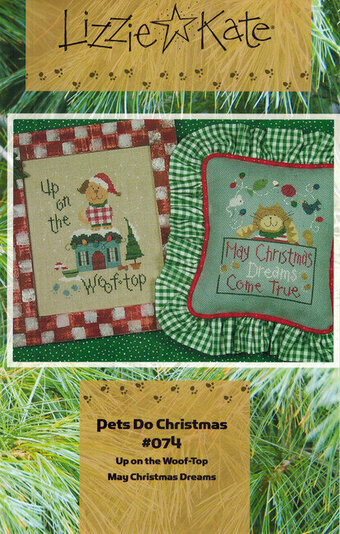 Stitch counts for ornaments are 64x85, 49x87, 36x77 and 31x76. Model stitched on 14 Ct./28 Ct. fabric of your choice with DMC floss. Finished size: 4 1/4" x 4 1/2". Designed by Peter Underhill. Model stitched over 2 threads on 28 Ct. Mirage Lugana by Picture This Plus with DMC floss. Stitch count are about 55x67 for each ornament. Model stitched over 2 threads on 35 Ct. Confederate Gray linen with Gentle Art Sampler threads. Stitch Count: 59x152. Finishing instructions included. Model stitched on 28 Ct. Platinum Cashel Linen with Gentle Arts Sampler Threads, Week Dye Works thread, and Classic Colorworks thread. Stitch count is 48W x 56H. 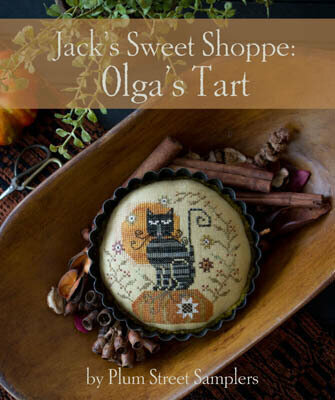 Book includes 12 patterns. 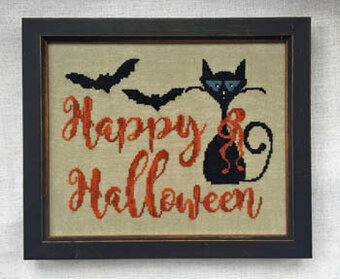 "Halloween Spider" stitch count 37x40. 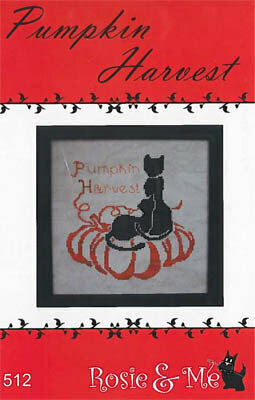 "Jack-O-Lantern Silhouette" stitch count 30x38. 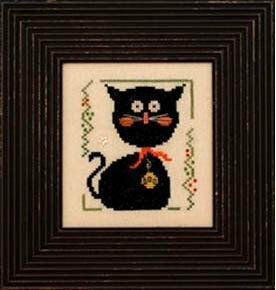 "Cat Silhouette" stitch count 30x38. 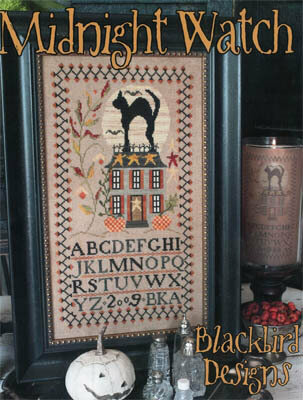 "Halloween Crow" stitch count 38x40. 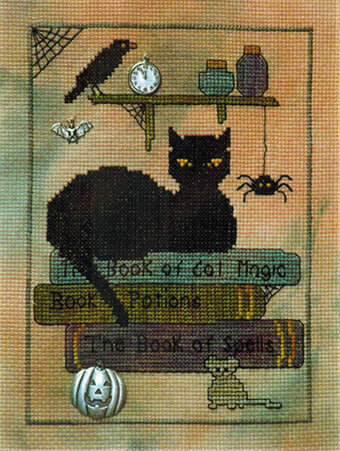 "Witchy Owl & Pumpkin" stitch count 35x47. 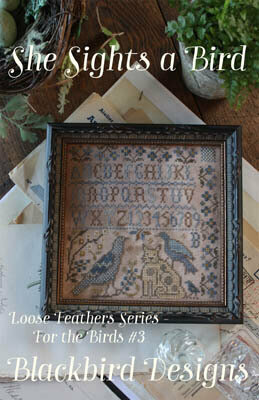 "Owl Silhouette" stitch count 30x38. 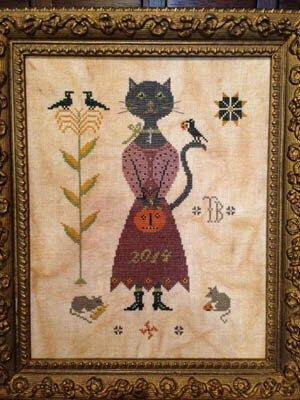 "Crow & Jack-O-Lantern" stitch count 30x38. 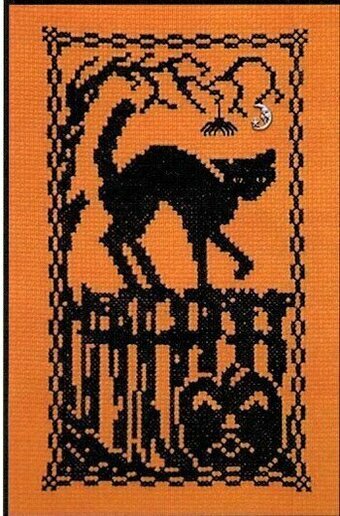 "Halloween Kitty" stitch count 42x34. 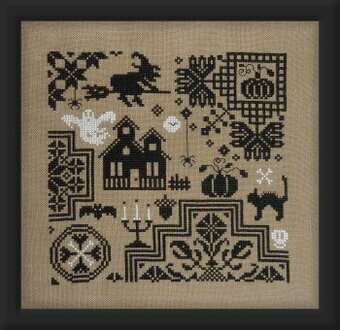 "Bat & Jack-O-Lantern" stitch count 30x38. 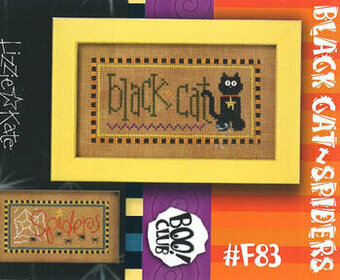 "Boo Ghostly Stand-Up" stitch count 56x84. "Witch Shoe" stitch count 64x92. 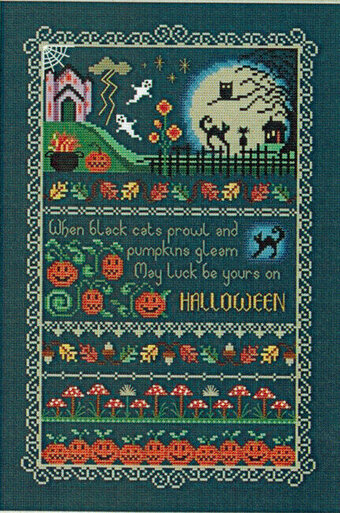 "The Crow's Bat Pumpkin" stitch count 63x107.